The "VANQUISH" looking for tide and current trends to the north of Cowes. It is the day before the start of the 2011 Rolex Fastnet Race and the Oakcliff AAOT is excited and ready. Although this is a much shorter race than the Transatlantic, it can be one of the most difficult in terms of navigation and weather. 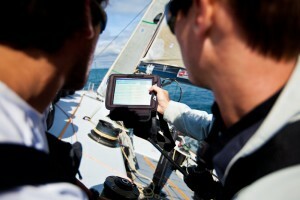 After a discussion with our navigator, Chris Branning, it sounds like we will have a fast race. However, we know not to get our hopes up on long term weather forecasts; this was a lesson learned in the Transatlantic Race as we sat within 250 miles of the finish for the last 3 days. Branning told me all three models are currently showing an upwind starboard-tack fetch to Lands End (Southwestern tip of England) in 10 to 15 knots. Once we turn the corner there, it shows a fast reach out to Fastnet Rock and back in about 17 to 22 knots. When we hit Bishops Rock (near Lands End) on the return we will turn down to more of a run. As of right now, these models show us finishing around midnight on Tuesday night. After a successful reconnaissance sail yesterday we learned a lot about the current in the Solent, where we will start the race off of Cowes. We left the dock early to simulate the tides we will have for our start tomorrow and sailed the first part of the race out to the Needles. The Needles are at the Western most end of the Isle of Wight. Fortunately, there were no major current differences across our course. It was all strong with the water moving at about 4 knots across the Solent. The English Channel is known for extremely strong current which adds a whole new aspect to this race compared to the Transat. Today the team is finishing up a few minor projects and provisioning the boat. It is in excellent condition thanks to the team members that stayed in England to work on the boat. Jan Majer, Nathan Fast, Molly Robinson, Matt Noble and David Rasmussen all have done a terrific job in making the Vanquish look as good as ever. We also want to thank our many supporters and sponsors who have made it possible for us to not only sail across the ocean but also compete in the Fastnet, one of the most famous ocean races in the world. Stay tuned for many updates during the race from our photographer and videographer, Amory Ross.